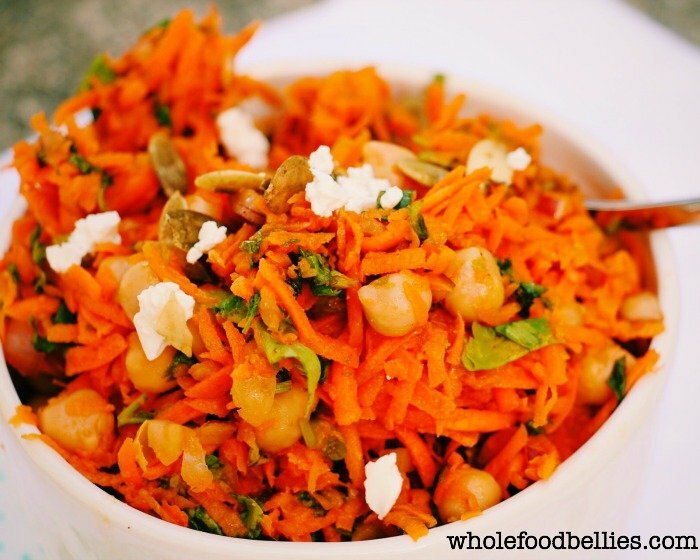 This lovely little Marrakesh Carrot Salad recipe is from the new Sprouted Kitchen cookbook from Sara Forte. Her first cookbook is actually what inspired me to look at cooking in a different way! On leaving Australia, I gifted my much-loved The Sprouted Kitchen cookbook to my sister. It was a fitting farewell present as we had made so many great meals from it, and I attach so many lovely memories to that book. I have been eagerly awaiting the arrival of Bowl and Spoon for so long. As soon as I heard about it I pre-ordered a copy, as eager followers do, and I waited for what seemed like forever for it to get here. It arrived on a week where my 8 month old was sick and teething. I didn’t have the time to give it the attention it deserved (meaning, I didn’t have the time to sit on the couch with a glass of wine, and some sticky notes, after the kids were in bed) so it languished on the shelf for what seemed like forever. Finally, I have had a chance to per-use my sticky notes. Yay! Now, at first glance there aren’t as many bookmarked recipes as I had anticipated. Don’t get me wrong there are still a heap of recipes dog-marked…it’s just that with my last purchase I used nearly a whole ream. 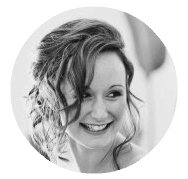 This time, the recipes still look fantastic (her husband Hugh is the photographer, and he is just amazing), but there’s a lot of time and effort to be put into them. Time and effort which I just can’t afford these days. The recipes that we have had a chance to try have all been absolutely amazing. So far we have sampled: Coconut Sorbet with Strawberry Rhubarb Sauce, Spring Noodles with Artichokes, Pecorino, and Charred Lemons, Curried Sweet Potato Soup with Crispy Black Lentils and this Marrakesh Carrot salad. 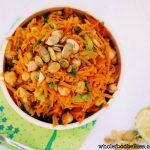 I thought I would include the Marrakesh Carrot Salad here, as it is the perfect side for all those upcoming backyard barbecues (hint hint: Memorial Day). I have brought it along to two different potlucks so far, and it has been very popular. It’s also quick and easy to put together, which is a huge bonus. Are you a fan of the Sprouted Kitchen? 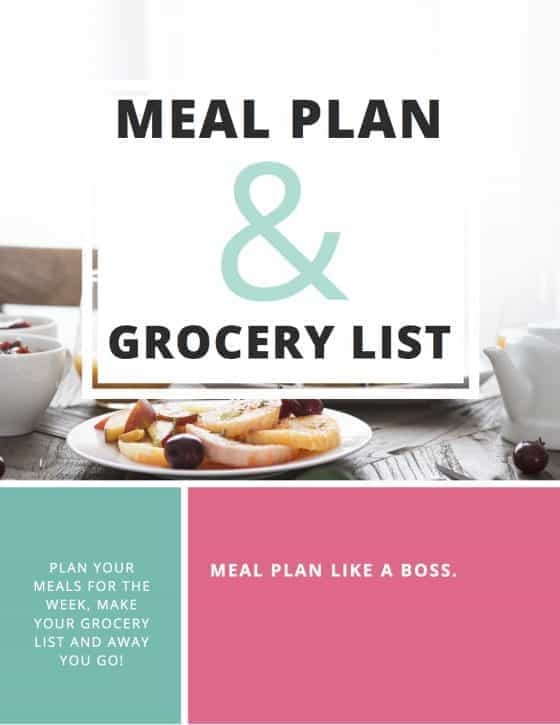 What did you think of the new cookbook? Leave a comment, like on Facebook, tweet on Twitter or pin to Pinterest! I was not asked to do this review. All opinions are my own and I purchased the cookbook myself. I finally made this today and it was DELICIOUS! Oh I am so glad you enjoyed!!! 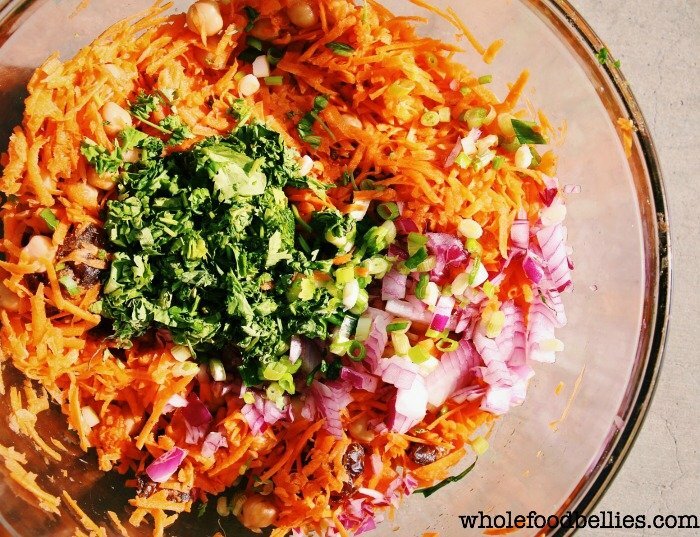 It’s a rare thing that I like that many carrots in a salad, but I looked over the recipe and I like the contrast of some of the foods included. The marjool dates would be a great addition to the slight sweet of the carrots. Not sure about the onions or the garbanzo beans though. The dressing looks like it would be delicious, as does the feta cheese! Feta cheese is good on anything, though. Feta is pretty delicious Helena 🙂 I was a bit dubious about all the carrots to start off with as well, but it was delicious! This looks absolutely gorgeous – I’m going to make this this week! I love fresh crunchy salads so thank you for this! You are very welcome! I hope you enjoy! Thanks for the FYI, will take a look. This salad looks amazingly delicious! We will definitely be trying this one at our house! I hope you do Valerie 🙂 Enjoy! This sounds very good. I have to run into town today and will pick up a couple of things I don’t have. I bet it’s a hit at the cabin this weekend! This looks delicious, and I actually have all of those ingredients on-hand right now! I love all of the colors here, so beautiful! I recently grated up a sweet potato and loved the different texture that the grater creates. I’ll have to try this version with carrots! Thanks for sharing. That looks super yummy! Such a great idea for summer BBQs. Yummy and healthy, the best of both worlds! Carrots are one of the only veggies I loved as a child and I am still very fond of them, I’ve never used them as a base to a salad though. It looks so light and tangy! I bet with fresh carrots from the garden it would be delicious. 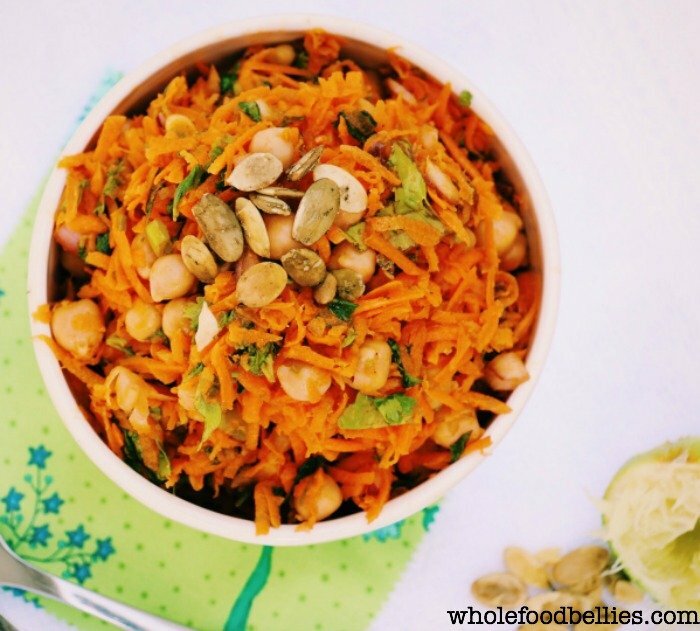 I LOVE the sound of this, it would be a great side dish for a picnic or BBQ! I don’t think I’ve ever had a carrot salad before but this sounds delicious! I’d love to try it! 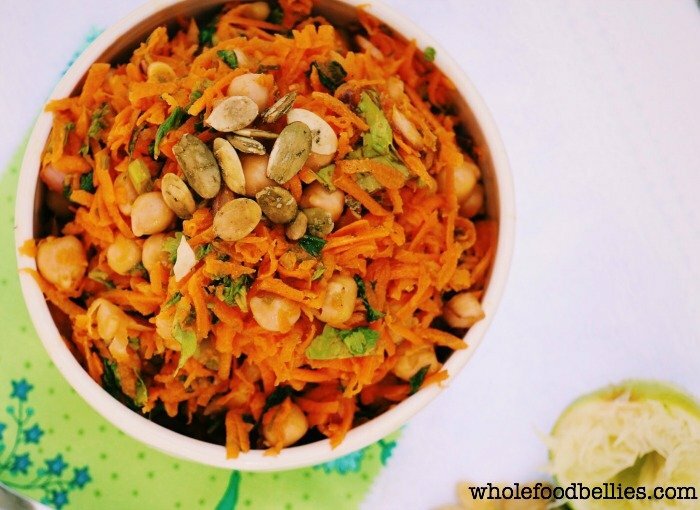 You are missing out Miranda 🙂 I have been a fan of carrot salad for a long time which is why this recipe piqued my interest – so good for summer! This salad looks so yummy. I need to make it.